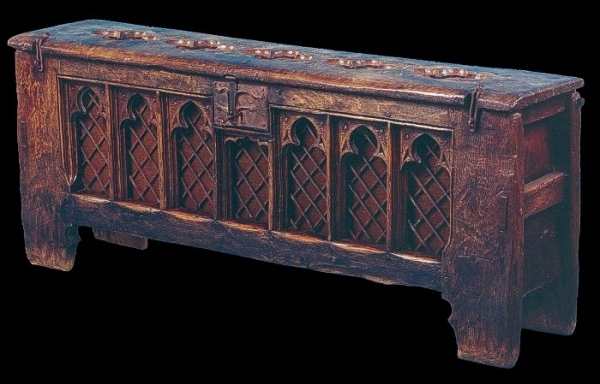 REPLICA 14TH CENTURY CLAMPED FRONT CHEST, handmade from kiln dried English oak, with trefoil heads to openings on the front and pierced quatrefoils to the pin hinged lid. The mullions on the front have Perpendicular style mouldings, hand cut, with swept ends and masons mitres. The working lock (with key!) and hasps were hand made from wrought iron. The design of this furniture has been adapted from a true clamped front chest to make it usable as means of concealing a modern radiator. An original would have had one wide horizontal board on the front long-tenoned into equally long mortices in the vertical stiles, but otherwise the construction remains true to the period. For a guide to typical prices of originals, see Boarded Chest.